Here are a couple pictures of how my code-0 is setup. 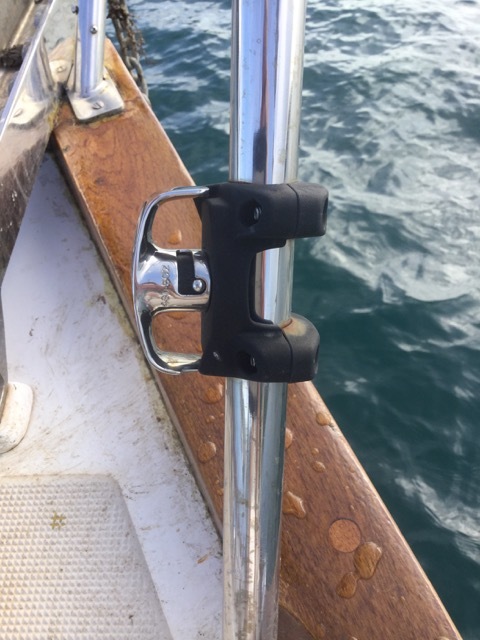 There is no tacking, the thing has to be furled and redeployed on the new tack. I always raise mine on the port side as that is the side of the halyard. I had to modify the roller a bit (drill the pin hole larger for the shackle). I don’t use that pin cause it doesn’t work with the anchor. The picture below shows the inner ear of the starboard roller and is was drilled larger so that the shackle will fit (anchor deployed in this picture since I’m on the hook in Grenada). Next photo is from higher up so you can see that there is almost no space between the code-0 and the Jib. The code-0 is just a few inches in front of the Jib. As i said before, the sheets are run back to the last block on the rail. 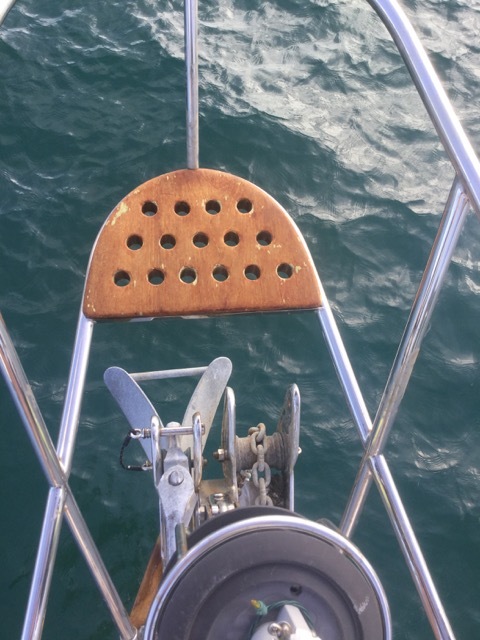 I usually use the staysail turning block as I don’t fly the staysail and Code-0 at the same time. 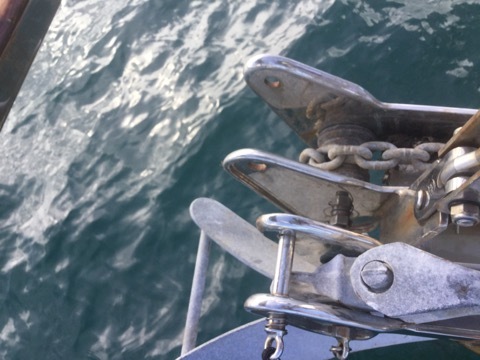 The next picture is of the furling system, there large shackle that is used to connect the bottom to the anchor roller. 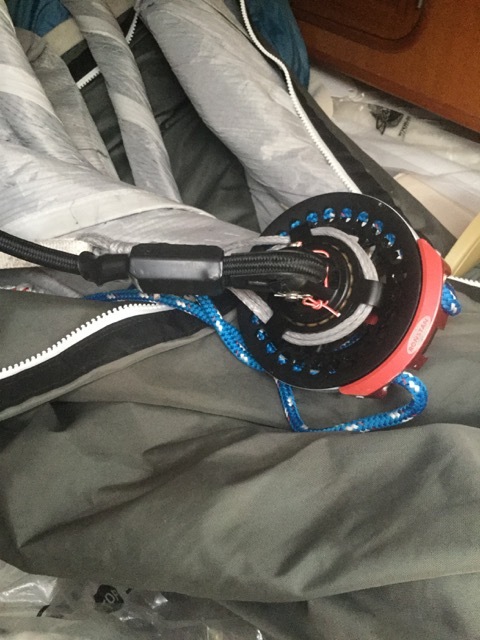 *i should clean that shackle* The blue line is the continuous loop furling line (about 80ft so it can be run two the cockpit). 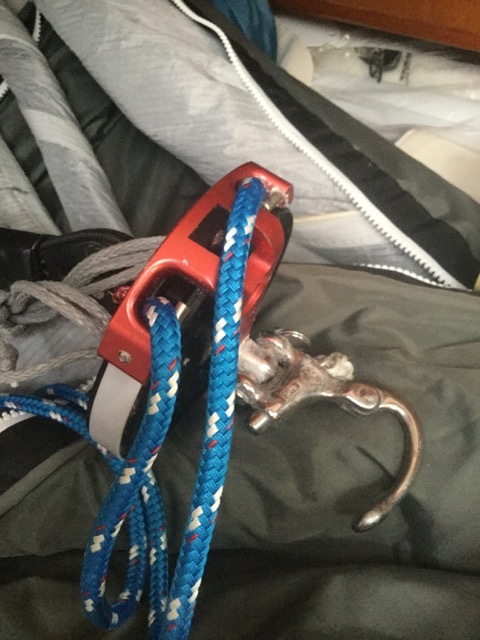 The last picture is of the top side of the furling system (Ronstan top down furling). There is spectra line to hold the foot of the sail to the furling system and the thick black line is the luft line that the sail is sewn into. Since it is mounted on the anchor roller, the sail is about 2 feet from the furling system so that it clears the pulpit.